Many say life is fragile, life is precious, live like there is no tomorrow, we only live once yadda yadda...mp3 players...I thought there are truths in these sayings. 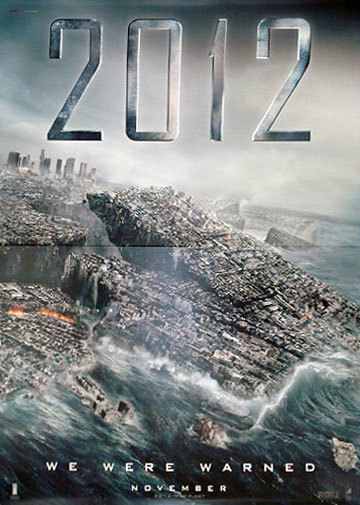 Yesterday morning a friend shared with me a message from a group of Indonesians who think that 2012 will be the end of the world. I listened to what my friend has to say about it and it kept me wonder...Why can't people focus on appreciating life despite digging and predicting too much about the end of the world with their own wisdom? After an easy persuasion, Nok finally bought me to the movie *thanx ladynok*. Overall to what I can say (as a lousy reviewer), it was a Noah & the Ark wannabe! I enjoyed the graphics immensely though but I can't tolerate the smell of rotten socks! Screw-driver was the person who sat behind us. Thanks for giving me "cinematic-asthma" the whole 21/2 hours! I tried to doubt it the moment I was about to leave my seat but apparently the guy was just about to put his shoes on and preserve the smell! Arrrggghhh how I hate stinky socks!! !